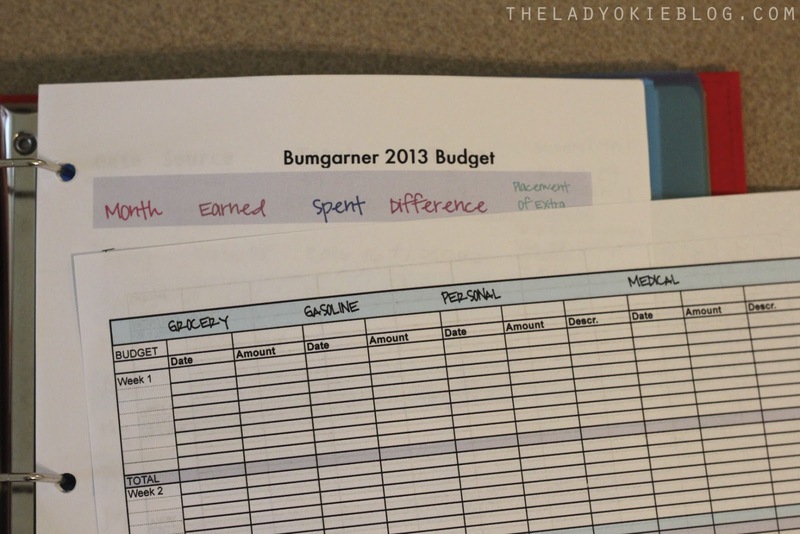 A few months ago I wrote this post about our budget binder. Within a few weeks, it quickly jumped up the rankings to become my second-most popular post and continues to get hits every day. After I published the post, I received a good number of responses (more than my usual five)--on the blog, through facebook, and in person. A lot of people wondered why I am still doing budgeting stuff on paper and haven't started doing everything online. Mint.com was mentioned more than a few times as a great resource, and I have no doubt it is something I will check into at some point. As of right now, we pay some bills online, but I keep track of everything on paper. It's a system that works well, and it's a system that has allowed us to use the last two years to become completely debt free while saving up thousands of dollars for the beginning of a down payment on a house. We paid off both our cars and student loans within the first 18 months of our marriage. The critical comments I received from people who thought I was ridiculous for still budgeting on paper were balanced out by the people who had legitimate questions about how we budget; and I even had a few friends ask me if I could sit down with them and go through the binder and our system in more detail. 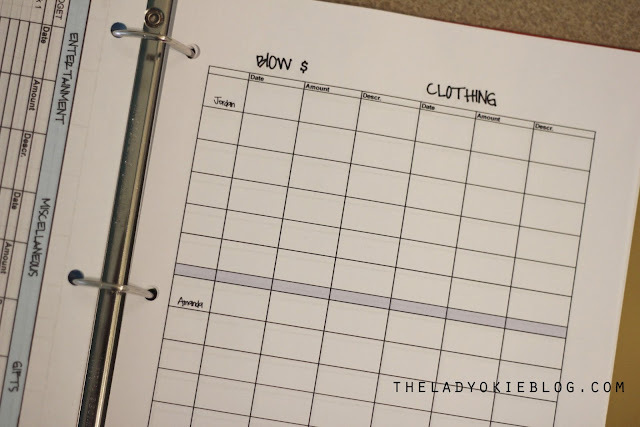 With that in mind, I decided it might be helpful if I went through the binder again to explain the categories and our system for spending personal money for clothing and other items like that. I'm warning you now that this post isn't short, so skim until the end or quit now if you want to. But I do hope this is helpful to some of you! Budgeting is hard work, but it does get easier. We've been using this system for 2 years, and it's become basically second nature now. 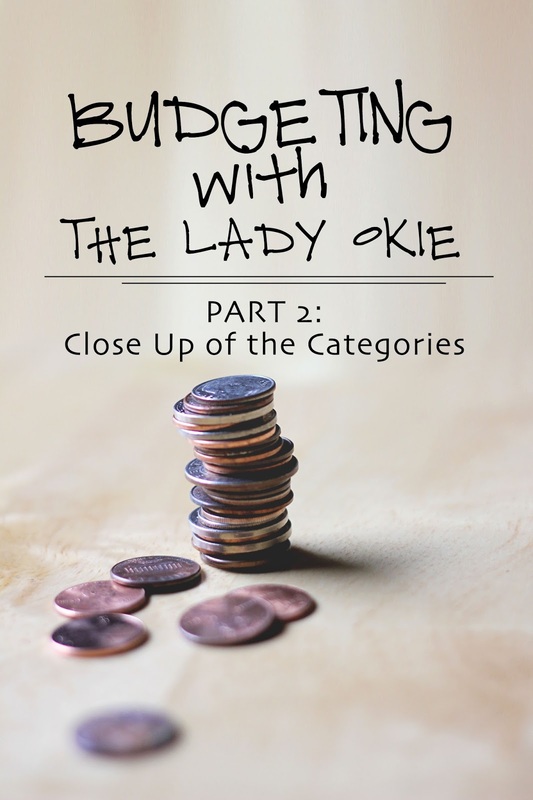 I also want to say that there are tons of amazing budgeting systems out there. This is just what Jordan and I have found to work best for us at this point in our lives. 1. We keep and log every single receipt on a spreadsheet. 2. We do NOT buy anything we don't have the money in our bank account for. 3. We use our credit card for most purchases, but we pay off the full amount at the end of every month. AUTO--annual car tags, oil changes, windshield wipers, tires, etc. Our monthly budget allows $ for the entertainment category, and anything that's left over at the end of the month goes into the entertainment envelope. This is a great system, because I'm sure you've noticed that some months you eat out or go on dates or do things with friends more than other months. So by rolling over any extra entertainment $, we can save up for expensive date nights or have some extra spending money just in case one month is busier than another. Unlike the Christmas envelope, we do NOT put a specific amount into these categories every month. The amount added depends on that month's surplus after paying bills and tithing. We try to at least put $20 into each envelope; that way when an emergency happens like all your tires go flat at once, you have cash on hand to spend on expensive medication, tires, etc. Okay, now to the actual budgeted categories, of which there are six. 1. Grocery--obviously, buying groceries. This includes eating out for lunch during the week (Taco Bell, Subway, etc.) We try to eat out during lunch maximum 1 day/week; all other times we pack a lunch. Eating out for dinner counts under entertainment. I'm not going to share actual amounts for most categories, but I will for this one. For the two of us, our monthly grocery budget is $350. Jordan thought that was a lot until I did the math. $350 = $175/person = $5.83/day. That means it costs less than $2/person per MEAL all month long. Pretty good, if you ask me. 2. Gas--You can't completely budget 100% for car gas, but we do try to keep this number in mind as we go through the month. With this, we do something that's probably a bit different from "normal" couples, at least that I've talked to. Every month Jordan and I have an allowance, for lack of a better word, for clothing and "blow money," which just means money we can spend on whatever we want. For running shoes, I usually try to just ask for those for a birthday or Christmas. If that doesn't happen, I have to save up my clothing $ for a few months before I buy my shoes. Again, it's very important that we do NOT buy anything we don't actually have the money on hand for. This one can get tricky, and it's the category Jordan and I have to discuss the most often. Blow money is basically anything we want to buy for ourselves. So, for example, I sign up for races using my blow money. I sponsor a blog or host a giveaway using my blow money. I use my blow money for magazine subscriptions or new camera equipment. Jordan uses his to buy video games, ammo for his guns, and pay for things like MLB TV, among other things. I will say this: I go through my money pretty quick. Races aren't cheap, my friends. Jordan rarely uses all of his money for the month, so I get really happy when I spend less than him. Last month I was lower than him by a whopping 81 cents. It was great. What happens with extra blow/clothing money? Whenever there is leftover allowance, it goes into the Amanda or Jordan envelope. Yes, we each have our own envelopes where we keep "our" money. This is how I save up for a race or a new pair of shoes. I saved up for my camera for a year. A year! It was not easy. Our Christmas bonuses from work, birthday money, and Christmas money also go into our personal envelopes. And, any money we get from doing outside jobs we can keep as our own. So, if I get money from taking pictures or Jordan gets money for doing some electrical work for a neighbor, we keep it ourselves. But I do think it keeps us accountable to the money we spend and where it goes. Having personal clothing and blow money also eliminates those fights about "how could you spend so much money on races?!" I can sign up for as many races as I want if I have the money for it, and Jordan might think it's stupid, but that's why I have my money and he has his. So overall, for us at least, the pros weight out the cons. Okay. I think that's all for the categories. Whew! I told you that was going to be long. If you have any questions at all, I would love to answer them! Ask in the comments or shoot me an email (abumgarner [dot] editor [at] gmail [dot] com). 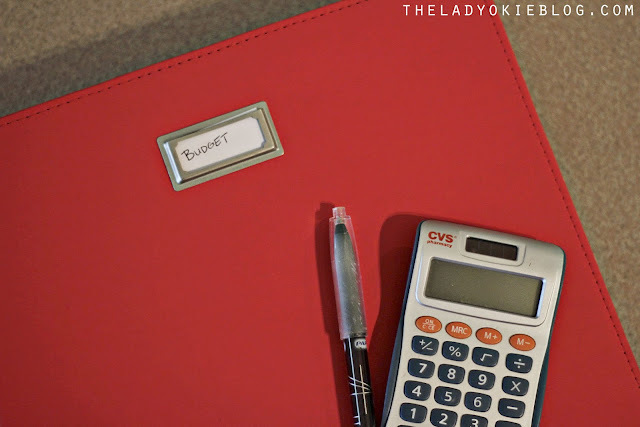 I'm not shy about discussing budgeting stuff, and I think everyone needs to budget! How do you handle clothing/blow money? I handle almost all the bills and budgeting because my husband is BAD with math. I'm pretty sure looking at too many numbers physically hurts him. Sometimes it gets weird if he has to ask "permission" to buy something, but it's not like I'll tell him no if we have the money. I'm definitely going to look over this because our spending definitely needs a rehaul. Norris and I do have a budget. Which I am horrible at sticking to. I am an awful impulse shopper and have very poor self-control. But we do have the rule that we can only eat out if we are going out with friends or family. This spawned from us realizing we were ordering pizza or takeout at least once a week and it was a total drain. Also, I would like to shout out to my husband, who took me from being a girl with no savings and copious overdraft fees to a woman with a bountiful savings account and the freedom to buy books on Amazon with regularity. Budgets work, y'all! For the record, we use Quicken, and have a monthly meeting where we go over all the data and look at the graphs of our spending vs. our income. Wow- this blog has just changed my life! We did the Dave Ramsey class in the months leading up to our marriage. Taking the class helped a lot, but for some reason we didn't stick with it. We started making excuses, dipped into what we had saved (which at one point was a lot!) and now we're doing the same old thing, trying to pay off the little debt we have and keeping up. I think this is going to be life changing and life improving... I can't wait to sit down with Greg and show him this blog! Thanks so much!!! After a divorce and learning how to do it all on one income, I'm the one with all the late fees and no savings and I hate it! And now that I'm starting grad school, a budget is a MUST! I love your little binder and like writing things down on paper too! (Hey, I still like writing checks haha) so how do you "budget" or what categories do you use for bills? Like utilities, cable, mortgage/rent, telephone, etc? $350 dollars a month for food seems undoable for me. I live in Seattle tho where things are a bit expensive. Im wondering where you live and what kind of food you eat/how you plan meals. We are a family of three and our budget is $800 a month for groceries. Btw, I budget with a yellow legal pad and a calendar. I have tried using online budgeting tools but for some reason with writing it down I stick to it better. Hi, Mallory. We're just a family of 2, so that helps with the food cost. I live in Oklahoma, and the cost of living is certainly less than you will get in Seattle. We eat a lot of chicken and beef. One of the easiest and cheapest meals that we love is: http://www.theladyokieblog.com/2013/04/skillet-meal-chicken-rice-bowl.html. This is another simple and cheap meal: http://www.theladyokieblog.com/2013/10/crock-pot-chicken-wild-rice-aka-jordans.html. I don't know if you have dietary restrictions, but we eat a lot of pasta and rice dishes as well, which is fairly cheap. This might be the great advice for me. I'll keep it in mind. Thanks. Thank you so much!! This is so perfect and so so helpful.